I TAKE MY NIKON COOLPIX DIGITAL CAMERA with me wherever I go, so I can take advantage of unexpected photo-opportunities. Here are some pictures from mid-September (the top two posted the same day they were taken), and one from the archive. 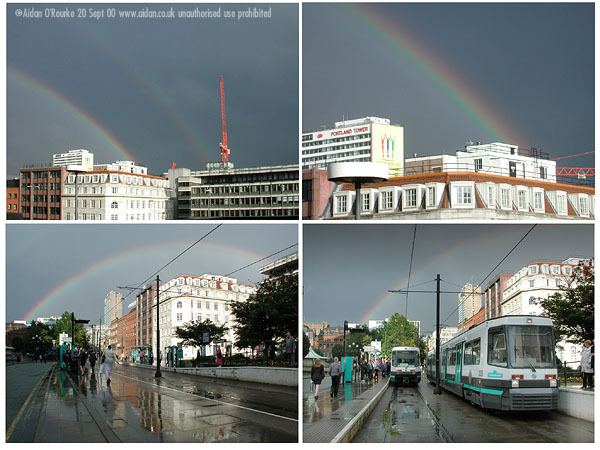 HEAVY RAIN AND GREY SKIES were followed by bright sunshine and blue skies on Wednesday 20th September, 2000, leading to some amazing rainbows over Manchester city centre. The two upper views are from the Arts Library on the second floor of the Central Library - we can see the Commonwealth Games insignia put up by Bruntwood Properties on the south wall of Portland Tower (built 1962). 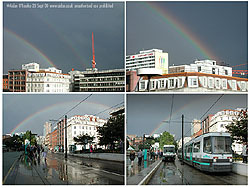 The white building visible in all four pictures is Century House, (built 1939). The Sunley Tower, part of Piccadilly Plaza (completed 1965) is brightly lit, standing out from the grey rain clouds beyond. The tram lower right about to depart for Salford Quays and Eccles. The time is about 5pm. People say it always rains in Manchester, but the rain often gives way to sunshine, as we can see here. THE MANCHESTER AQUATICS CENTRE, also known as the Commonwealth Games Pool, opened its doors to the public on Monday 18 September 2000, in time for the start of the university term. I'll be dipping my toe in the water soon, and will publish some interior views of the complex. 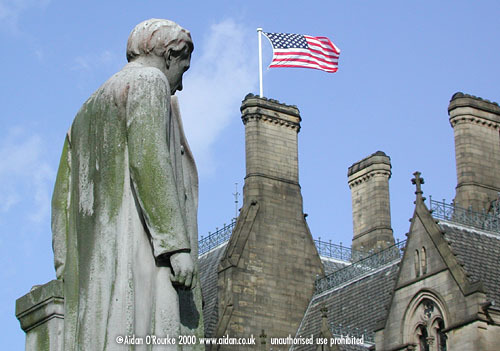 THE AMERICAN FLAG flies over Manchester Town Hall (built 1873). To the left is the statue of Oliver Heywood, the distinguished 19th century public figure. Flags of foreign nations are often flown over the Town Hall, for example on national days or on the occasion of official visits from overseas. This photograph was taken in early September 2000 - Thanks to all those readers who e-mailed me to say that the reason why the flag is being flown is it's Labor Day. BAR 38 is the unique triangular-shaped plate-glass construction which replaced the grimy row of buildings at the bottom of Peter Street. Behind it is a sunken amphitheatre. Behind us is the Great Northern building, which hasn't opened as the Great Northern Experience. It's July and office workers have flocked here to spend their lunchtime in the open air. Just a couple of years ago, this area was a back yard car park. 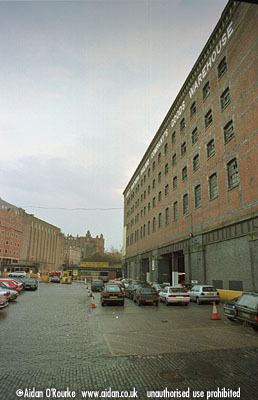 THE COBBLED FORECOURT OF the Great Northern Railway Goods Warehouse is seen here on a drizzly day in 1997. The Great Northern Railway GoodsWarehouse was built in the 1880's and was in use until the early 1970's. Trains arrived at the opposite end of the warehouse, goods were unloaded, stored on the upper floors and eventually taken to their destination by horse and cart, in later years by lorry. A canal running underneath the building was also used for the transshipment of goods. After closure, the builidng was converted into a car park. In 1998, work commenced on converting the warehouse into the Great Northern Experience, an ambitious leisure and entertainment complex. In the distance can see the CIS tower, and on Market Street, the only facade on the east side of Market St to have survived the Arndale Centre, in fact, it was incorporated into it. To the far right we see Lowry House, one of the tallest and in my opinion ugliest office towers in Manchester. Just off the picture to the right is the Central Post office. The CIS has been granted planning permission to build a retail development on this site. MORE PICTURES and articles from Manchester and surrounding districts will appear soon.